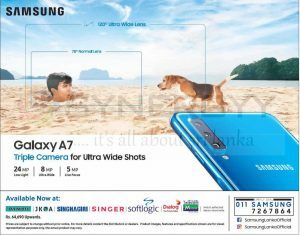 Samsung Sri Lanka brought you a Samsung A7 triple camera smart phone at an affordable price of Rs. 64,690/-. Prices are subject to change without prior notice. 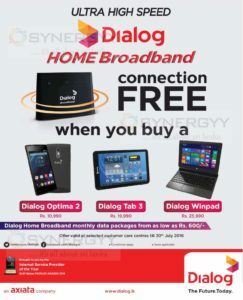 For more details contact the distributors or dealers. Product images, features and specifications shown are for visual representation purposes only, the actual product may vary. Softlogic offers upto 60 month interest free installment schemes for selected credit card. 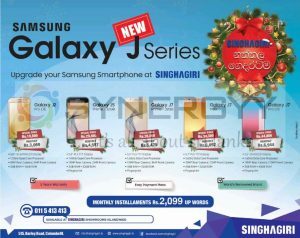 Samsung Sri Lanka brought you Samsung J Series mobile phones at an affordable price for this festive season. 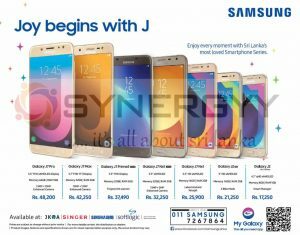 See below table for the latest Samsung J Series Mobile phone prices. Sri Lank Telecom Mobitel Brought you a android powered BlackBerry Key one Limited Edition Black into Sri Lanka for Rs.99,900/-. Enjoy the first time in Sri Lanka dual sim in a blackberry smartphone with 4GB RAM, 64GB Rom and Expandable memory. And the mobile comes with smart keyboard with figure print sensor and DTEK App for safety and privacy. Mobile offers you a special bundle offer of call worth of Rs. 150 for 3 Months and 4GB Data for 12 Months. 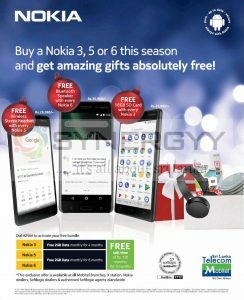 Mobitel and Softlogic brought you a special promotion for Nokia smart phone on this season. Buy your Nokia 3, Nokia 5 or Nokia 6 and get free gifts and internet packages from Mobitel for free. And all of the above Rs. 150/- worth of free talk time for 3 months. 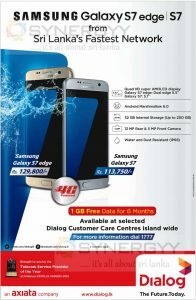 This exclusive offer is available at all Mobitel Branches, X station, Nokia dealers, Softlogic dealers & authorised Softlogic agents islandwide. If you are a photogenic person; here is a camera for you, Huawei Nova 2i comes with 4 cameras 2 in front and 2 in back to make your photos well including depth of field. And now Huawei Nova 2i bring you an option to take photo in RAW format too. In a simple review Huawei Nova 2i is a well suits phone for those who love taking photos and big screen performance and better battery life. And other features of1GB RAM, 64GB ROM and expandable memory of 256GB and 5.9” Fullview Display with 3340mAh Battery. 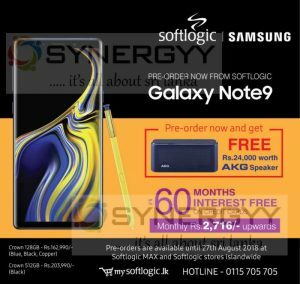 This offer valid at all Samsung Galaxy Note 8 sellers of JKOA, Singer, Singhagiri, Softlogic, Wow.lk and all authorized dealers island wide. 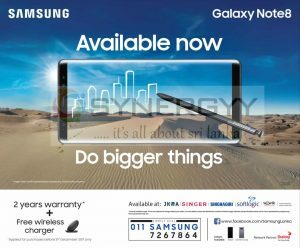 Samsung Sri Lanka brought you an attractive offer of Get Free Wireless Charger and 2 Year Warranty with your Samsung Galaxy Note8 with the price tag of Rs. 163,500/-. This offer applied purchases made on or before 31st December 2017. 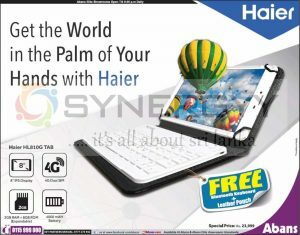 Abans brought you a Haier Tablet HL810G Tab at an affordable price of Rs. 23,999/- with Free Bluetooth keyboard and Leather Pouch. Be in touch with your business and networks with your latest Plan of your hands with Haier. 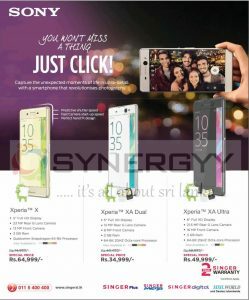 Singer Sri Lanka brought you Sony Xperia smart phones in Sri lanka at an affordable price of Rs. 34,999/- upwards. New Sony Xperia Smart phones are comes with high quality camera for Capture the unexpected moments of life in ultra-detail information. All Sony Xperia Mobiles comes with 2 Year Singer Warranty. 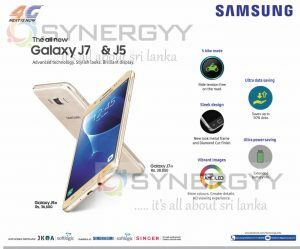 JKOA and Softlogic brought Samsung Galaxy J7 & Samsung Galaxy J6 in Sri Lanka at an affordable price. S bike mode – Ride tension free on the road. Ultra data saving – Saves up to 50% data. Sleek design – New look metal frame and Diamond Cut finish. Vibrant images – More colours. Greater details. HD viewing experience. Techsas International announces special promotions for the Greentel V8 Tab for Rs. 18,990/- with 1 year warranty and Free carrying pouches. 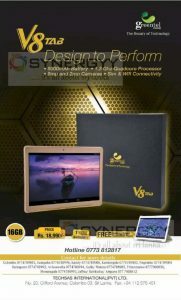 According to the current available market price Green Tel V8 Tab is the lowest tablet available in the market with value for money of below features. 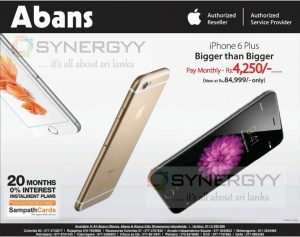 Abans announces a special instalment plan for the Apple iPhone 6 Plus with Sampath Bank Credit Card. Pay Rs. 4,250/- per month for 0% Interest 20 month’s instalment scheme. Or els you can puchases cash price of Rs. 84,999/- now at any Abans iShores or Abans elite showrooms. 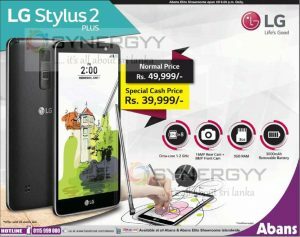 Abans announces a special promotion for the LG Stylus 2 Plus as Rs. 39,999.00 for cash price, with a latest facilities of 1.2 GHz Octa-core, 16 MP Rear Cam+8MP Front Cam, 3GB RAM and 3000mAh Removable Battery. 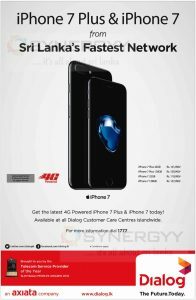 Dialog is an authorized reseller for Apple iPhone 7 & iPhone 7 Plus in Sri Lanka announces their new prices for iPhone 7 Plus & iPhone 7 range. If you are a Commercial Bank Credit Card or Debit Card Holders, here is an special promotion for you to purchases your Apple iPhone 7 or iPhone 7 Plus from Dialog 0% Interest Installment plans for 12 Months. 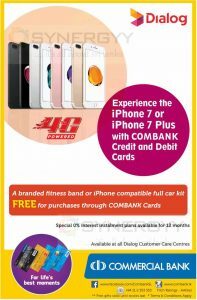 Dialog offer a special gift pack of a branded fitness band or iPhone compatible full car kit for FREE when you purchases through COMBANK Cards. For more details visit contact Dialog or Commercial Bank Branches next to you or simply see below image by clicking ad image. 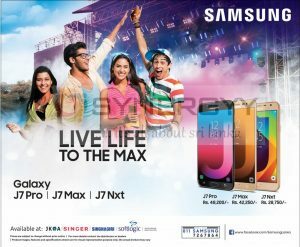 Softlogic Max is a apple authorised reseller for iPhone in Sri Lanka announces their special price for Apple iPhone 7 as Rs. 119,999/- upwards. Oppo a Chinese smart phone comes with an excellent 16 MP front camera for selfie oriented generations. The mobile reviews stated the Oppos F1s is much valuable for the money spend on it. Oppo F1s comes with 3GB RAM and 32 GB ROM. Sri Lanka Telecom Mobitel, has successfully trialed 4.5G LTE Advanced Pro Technology which is capable of achieving speeds exceeding 1 Gbps. Having launched the first Super 3.5G HSPA network in South Asia in December 2007, and subsequently trialed HSPA+, MIMO (Multiple Input Multiple Output) in 2009, another first in the region Sri Lanka Telecom Mobitel demonstrated 4G-LTE. technology also for the first time in South Asia in 2011. Keeping ahead with pioneering new technologies, Sri Lanka Telecom Mobitel has now trialed 4.5G LTE Advanced Technology yet again for the first time in South Asia. The factor behind the super-fast speeds in 4.5G LTE is the use of multiple carriers of spectrum to generate an aggregated spectrum block to deliver significant throughput for end-users. 4.5G Technology is claimed to bridge the gap between 4G Technology and 5G Technology, where 5G Technology is expected to be commercially available in 2020. For more details contact to Dialog on 1777 or visit any of Dialog Outlets.